There are many things in this universe which we considered as constant. The force of gravity, the escape velocity and The German reliability especially when it comes to cars, they produce cars that we love to drive. It was never a surprise when BMW entered the SUV market and announced the production of sporty, versatile and agile BMW X range. Over the years BMW have expanded the range significantly, BMW X1 which available in xDrive or SDrive, the bold and adventurous BMW X3 and X4, the luxurious BMW X5 and the elegant and dynamic BMW X6, all benefiting from BMW EfficientDynamics technologies that guarantee low fuel consumption and emissions. However now, there is a new member to this already enriched family – X7. 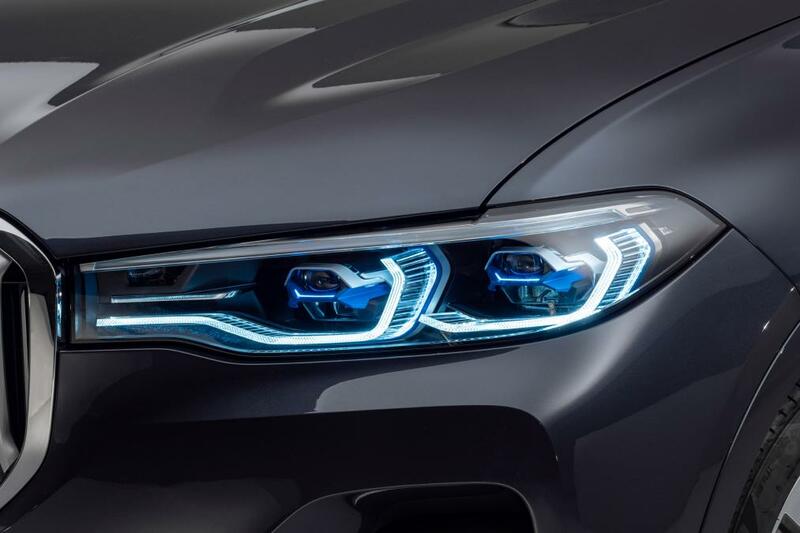 All models as standard get Adaptive LED headlights (front & back) and front fog-lamps, Four-zone automatic climate control is standard, but you can opt for a five-zone automatic climate control system with separate control panel and additional air vents for the third row of seats. 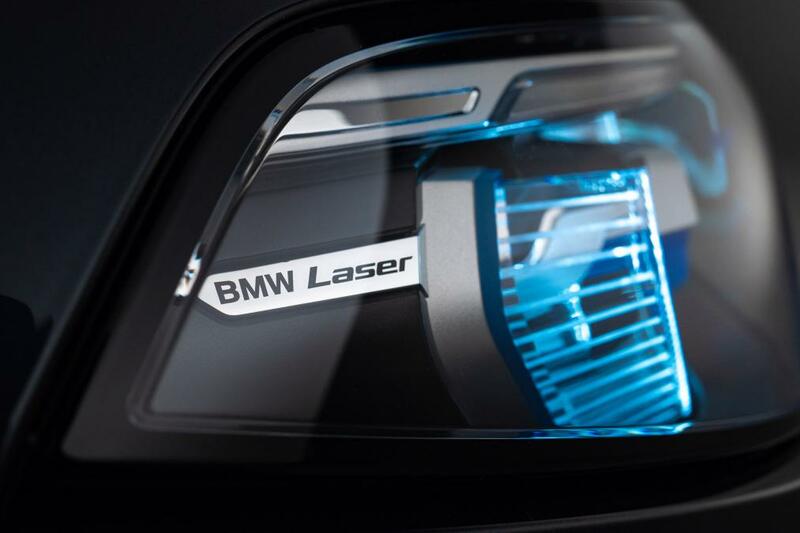 If it is really important, you can buy the Ambient Air Package to infuse the interior with eight individually selectable scents, and BMW Laser lights (delivers a spotlight with Selective Beam delivering a non-dazzling high beam range of 600 metres) as an option. BMW has literally introduced every update under the sun when it comes to X7, the newly designed display cluster that comes as part of the standard-fitted BMW Live Cockpit Professional includes a 12.3inc fully-digital Control Display, the centre console enables the driver to control most of the functionalities, iDrive Controller, the newly designed gear selector, start/stop button, and optional off-road modes to mention a few are all located in the centre console. The BMW X7 most prominent feature is the huge panoramic sunroof – comes as standard and it has three separate sections that can be opened all in one or individually. The Panorama glass roof features LED lighting to illuminate more than 15,000 graphic patterns to resemble a starlit sky. 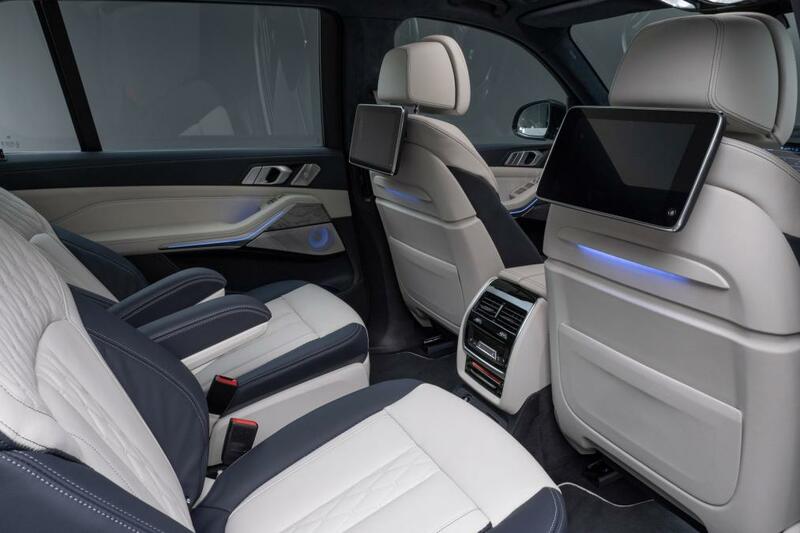 The BMW X7 has three rows of seats that offer space for up to seven adults. Boot capacity is 326 litres and increases to a maximum 2,120 litres when the backrests of the seats in the second and third rows are folded down, and for first time the new BMW X7 features a two-section split tailgate with both components have electric opening and closing as standard. The BMW X7 will be offered with a choice of three engines all with six cylinders and a 3.0-litre capacity. The entry level kicks off with the 265hp xDrive 30d diesel with 0-62mph in 7.0 seconds, next up is the xDrive 40i petrol with 340hp a 0-62mph time of 6.1 seconds, however the best one in my humble opinion is the M50d diesel, with its three turbos that launches this enormous beast from 0-62mph in just 5.4 seconds. Let’s put things into perspective here, if you think the interior update is colossus then this should simply blow you away. The optional Driving Assistant Professional package includes Cruise Control with braking function, as well as the Collision and Pedestrian Warning. The optional Active Cruise Control with Stop & Go function can bring car to a halt then set it back on its way automatically in 30 seconds. This system also provides Steering and Lane Control Assistant and Lane Keeping Assistant with active side collision protection and Lane Change Assistant, which is activated by using the indicator stalk. Rear Collision warning, Priority warning, Wrong-way warning and Lane Change Warning also form part of the Driving Assistant Professional package. Parking Assistant Plus is standard across all BMW X7 variants, which includes a rear-view camera, while Top View, Panorama View and 3D View functions which all work together to create a 360° image of the vehicle and the surrounding area on the Control Display. X7 is the largest model in the BMW X line-up and due to its sheer size will firmly clash with the Mercedes G-Wagon, Range Rover and the Audi Q8. The starting price of £72,155, will buy you the ‘basic’ 265bhp xDrive 30d diesel. If you decide to increase your budget, for a mere £74,155, you can get yourself a 340bhp xDrive 40i petrol version, or spend £87,240 for the M50d diesel model with 400bhp courtesy of three turbos. All sounds good, right? Well here is my issue with this giant of a car. A recent fact finding mission carried out by the U.K government for minor roads with speed limits of 40mph or below (residential roads). The mean road widths for such B, C and unclassified roads were 7.5 metres, 6.9 metres and 6.2 metres respectively. Assume an average mid-size car Width (1.7m) parked in either side of our small roads with incoming traffic and then through in this mammoth in the midst. The final result is Traffic and Chaos. Our City roads are already clogged up to the rim by over sized cars and less than perfect drivers, do we really need add more?